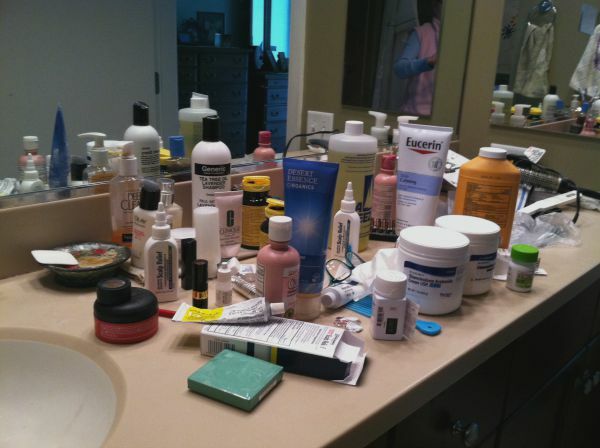 A cluttered bathroom countertop is a real buyer turnoff! Declutter your bathroom before placing your house on the real estate market to sell your home fast and for more money! For many home buyers, the bathroom is right up there with the kitchen as one of the most important rooms in a house. If your bathroom needs more than a little updating, a simple renovation could be the answer. Kitchens and bathrooms are two rooms where a renovation can give you a big return on your investment when selling your home. Todays' home buyers are looking for an updated bathroom decor, good storage, spaciousness and efficient lighting. They want to see upgraded countertops, tile bathtub or shower enclosures, and matching bathroom faucets and lighting fixtures. The “spa-like” look is still very much desired in the marketplace, especially in the master bathroom. Potential home buyers WILL look inside bathroom cabinets, drawers and linen closet. If you have too many things crammed inside, they'll get the impression that there isn’t enough room for their things. 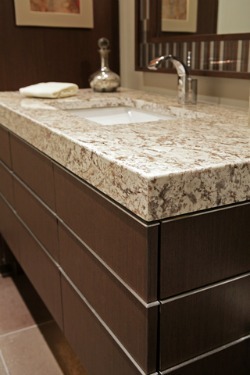 Bathroom countertops cluttered with daily items will look smaller and messy. If opening bathroom cabinets or a linen closet door causes an avalanche of towels to spill out, it's time to declutter your bathroom by editing out some things. Most home buyers are savvy enough to know that bathrooms are the second most expensive rooms in a house to renovate, and may walk away. Declutter your bathroom and stage it to keep home buyers from trying to negotiating the price down. Remove everything from the bathroom cabinets, linen closet and drawers. Take down the shower curtain, window treatments, wall art, and remove personal items from the shower and bathtub areas. Declutter your bathroom by going through each item, tossing makeup that has expired, unused appliances, and anything else that you don't need for daily use. Sort through the linen closet and remove ratty old towels and linens that you wouldn't want guests to see. When you stage your linen closet, follow the 50% rule. See staging the bathroom. Put only 50% of the items back in so that you create more "visual space." This will make your closet appear roomier then it really is. Pack up the rest of the stuff for your new home and make money by having a yard sale! Grimy glass shower door? Here’s a bathroom cleaning tip; remove the shower door, (if possible) clean it with a mixture of 1 part muriatic acid and 10 parts water. (Muriac acid is a corrosive acid, so wear goggles, gloves and protective clothing when applying it.) Scrub the door with #000 steel wool, wipe down and put the door back on. Find muriac acid at Lowe’s and other home improvement stores. Another product that works well on glass shower doors is “Kaboom.” This cleaner will remove soap scum, rust stains, and hard water deposits in your bathroom. Available at Walmart, Amazon, and most home improvement stores. Does your toilet run or leak around the base? Go to ﻿﻿﻿diynetwork﻿﻿ ﻿for tips on how to fix these, and many more problems. Old or mildewy shower curtains should get tossed, as mildew is almost impossible to get out! For home staging purposes, buy a pretty new shower curtain in a neutral color or pattern to make the bathroom look fresh. If possible, replace your shower curtain with a glass door or enclosure. Shower curtains actually block at least 1/3 of the visual space in a bathroom. Replacing it with a glass door will make the bathroom look larger, adding to the perceived value of your home. What is the condition of the bathroom walls? Grimy walls are a real buyer turnoff. They will assume that the entire home is dirty and neglected. Nothing updates a home faster (and cheaper!) than a fresh coat of paint. See interior colors for home staging for help in selecting paint colors that will help you sell your home fast. Clean the grime off all light switch plates and outlets. Make sure they all match. See diy home improvement for more tips on making repairs before selling your home. ﻿Is the bathroom mirror outdated? If you're stuck with one of those ugly builder grade mirrors, you might consider getting rid of it, as most buyers don't like them! Go to removing a glued on mirror to learn how to safely take down a large bathroom mirror, or update it by adding decorative trim around the edges. 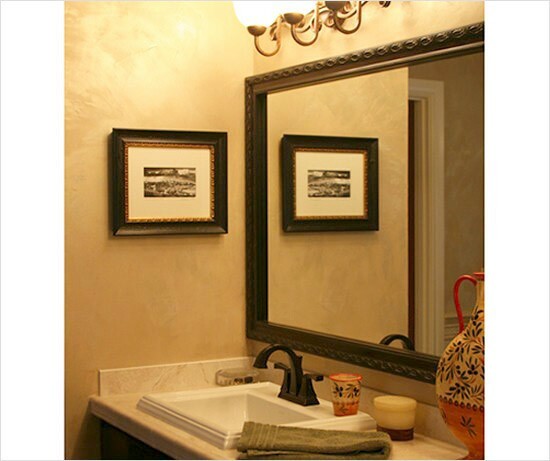 If you like the look of the mirror in the photo on the right, you can order the frame (or choose from other styles) from mirrormate.com. You simply select a style, measure your mirror and order. The pre-cut frames are easy to install; just press the frame right onto the glass while your mirror is on the wall. No tools or special skills needed! Bathroom tile grout lines should be cleaned to look fresh and new! Does the bathroom tile need regrouting? Go to www.homerenovations.about.com for directions on how to do this yourself. Do you need to re-caulk the bathroom shower or bathtub? Watch the helpful video below by iScaper1 on how to remove and replace moldy shower caulking. If tile is stained or outdated, and you can’t afford a bathroom renovation, reglaze or resurface it instead. In this process, layers of coats of resin are applied to the surface of the old tile. Resurfacing can be used on bathtubs, sinks, ceramic tiles, countertops and showers. This bathroom remodel will be a fraction of the cost of retiling the bathroom. Go to bathtubresurfacing-local.com to find a business that services your area. Home Depot has a diy repair kit for tile called, “Homax Tough as Tile” tub and sink refinishing kit. It's available in white or bisque. What is the condition of the floor? If you have carpet in your bathroom you should absolutely get rid of it! Carpet in a bathroom is always perplexing and may possibly be the one thing that scares house hunters away. 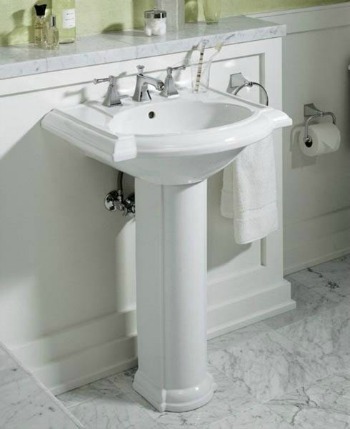 For a small bathroom, consider removing bathroom cabinets and replacing with a pedestal style sink. This will give the illusion of more space by showing off more of the floor. But, there is a tradeoff...many buyers would rather have storage space under the bathroom sink rather than extra visual space. In addition, sometimes removing the cabinets during a bathroom renovation will reveal missing flooring that will need replacing. Be sure to check that out before you start ripping up the floor! Replace the bathroom door with a sliding pocket door. This will give you more floor space inside the bathroom, as the old door will no longer protrude into the room. Help declutter your bathroom by opening up a wall to gain extra storage. Build recessed shelving or bathroom cabinets between the studs in a wall. For more small bathroom renovation ideas, go to small bathroom design ideas. If you do nothing else to update your bathroom decor, swapping out the bathroom faucets and fixtures will do wonders. The key is to make sure all the metal finishes match; this means the sink, tub and shower faucets, drain assemblies, lighting fixtures, even bathroom accessories like; towel bars, toilet paper holder, soap dish, shelving, and bathroom vanity drawer hardware. 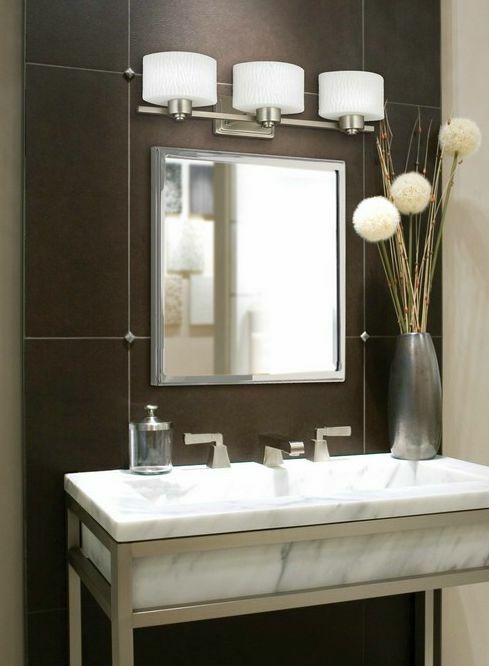 Safe bathroom design choices for metal finishes are polished chrome and brushed satin-nickel. Avoid brass colored fixtures, as they're taste specific and may seem outdated to buyers. Bathroom lighting fixtures should be sparkling clean! Take out the bulbs, shake out the bugs and throw lighting fixtures in the dishwasher. Replace dim bulbs with the brightest wattage allowable.